Dr. Christopher Arroyo, associate professor of philosophy, is the recipient of the 2017 Joseph R. Accinno Faculty Teaching Award, PC’s top teaching honor. What is the nature of the human mind? What does it take to live a good, healthy, happy life? Dr. Christopher Arroyo hoped to find the answers by studying psychology in college. But at St. John’s University, he encountered a core curriculum that required him to take philosophy classes as well — and was surprised to discover his questions thoroughly explored there. Arroyo made philosophy his major. He earned a Ph.D. from Fordham University, specializing in the philosophy of Immanuel Kant. After a year teaching at Dominican University in Blauvelt, N.Y., he joined the Providence College faculty as assistant professor of philosophy in 2007 and was promoted to associate professor in 2010. Arroyo is the recipient of the 2017 Joseph R. Accinno Faculty Teaching Award, PC’s top teaching honor. It is presented annually to the professor who best exhibits excellence in teaching, passion and enthusiasm for learning, and genuine concern for the academic and personal growth of students. The recipients are nominated by faculty, students, staff, and alumni. Arroyo once imagined that he would spend his academic career teaching specialized philosophy to advanced students. Instead, at PC, he teaches basics to non-majors. And that is fine with him. “I came out of grad school with aspirations to do some really specialized teaching and writing about philosophers like Kant and Edmund Husserl — very difficult, very technical philosophy,” Arroyo said. Dr. Julia Jordan-Zachery, associate professor of public and community services studies and last year’s Accinno Award recipient, said Arroyo is a “master teacher” who uses old-fashioned teaching tools — chalk and a chalkboard — in the classroom. Arroyo teaches General Ethics and a new seminar course, Catholic Sexual Ethics. He also teaches Development of Western Civilization to first-year and sophomore students in the Liberal Arts Honors Program. Students who have encountered him there attest to his ability. 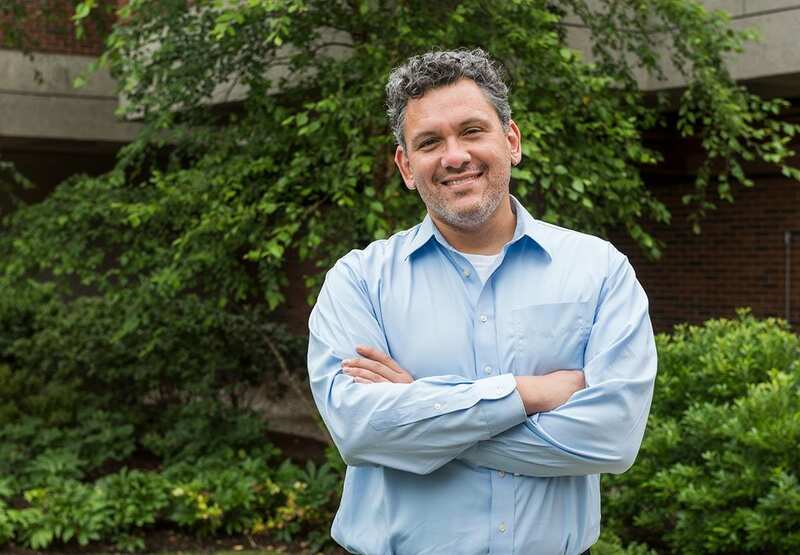 In a presentation to faculty colleagues in the Center for Teaching Excellence during the fall semester, Arroyo explained that he developed his teaching style by imitating his favorite professors at St. John’s and Fordham. He improved by team-teaching in the DWC Program, which features faculty from theology, history, and English, in addition to philosophy. That experience forced him to consider the goals of a course curriculum from start to finish, rather than to focus on individual class presentations. “A course is like an album that fits together; it’s not about a great track,” Arroyo said. In the classroom, Arroyo’s teaching seems spontaneous, but each lesson is a result of practice. “It’s preparation,” Arroyo said. “It’s not shooting from the hip. If it goes well, it looks like the first time, it feels like conversation. You get there by constant rehearsal. A large part of what I do in class is prepared in this way. The purpose is to create an environment where students “can be comfortable thinking about dangerous, scary, threatening ideas,” he said. 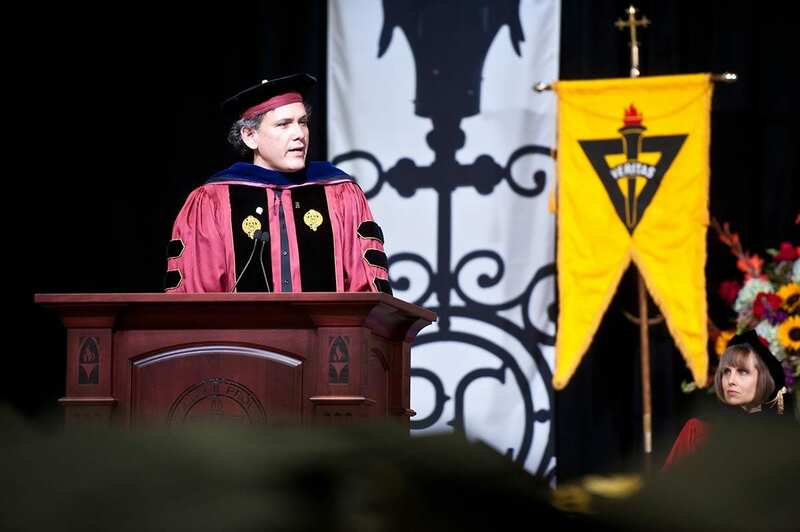 As the Accinno Award recipient, Dr. Christopher Arroyo addressed students and families at the Academic Awards Ceremony during Commencement Weekend in May 2017. Since kindergarten, Arroyo has never studied or taught anywhere but in a Catholic school. He grew up in Jamaica, Queens, and went to St. John’s on a scholarship. Every experience in college was new to him. At home, his family only read the newspaper; there was “no Plato on the shelves,” he said. Arroyo tries to live the College’s Catholic and Dominican mission by attending student events, performances, and athletics contests. With Dr. Tiffany Gaffney ’03, assistant dean of students, he is an adviser to SHEPARD, the support group for LGBT students. Arroyo and his wife, Amy, who live in Providence, support Next Step, an organization that helps adolescents and young adults with cancer, HIV/AIDS, and other life-threatening illnesses make the transition to adult living. Each July, Arroyo volunteers at a camp in Cambridge, Mass., run by the organization.